There’s nothing more exciting than stepping into your new city apartment, with a fresh feeling of independence and all the freedom to make it your own. While your first flat might be small there are plenty of ways you can maximize space while infusing your own personality into the interior. So whether you’re moving to a completely new city for a job or have started university not too far from home you can make you’re apartment yours without going into your overdraft or having to knock down a few walls. Small spaces can often feel claustrophobic without the right décor. 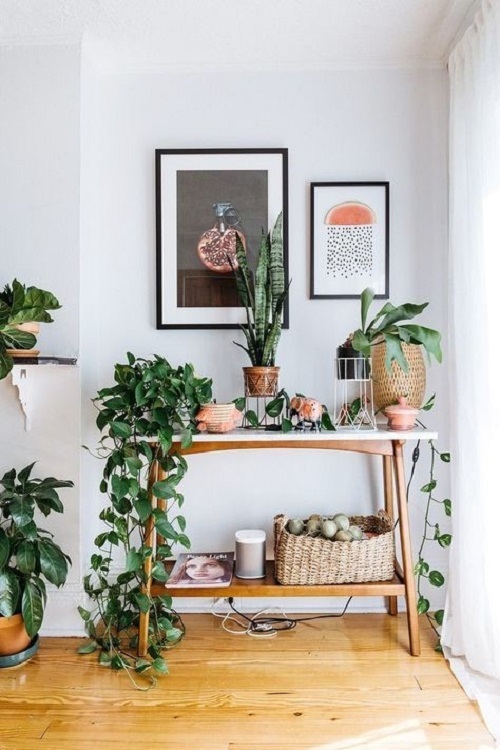 By simply adding a few plant pots or a couple of cacti to windowsills or coffee tables your room will feel far fresher with its little addition of life. While plants are proven to relive stress they also brighten up any darker corners and work with intense colours such as blacks, oranges and blues. Plants are the perfect way to place your cosy cave a little further from the urban jungle and create a zen atmosphere in a lively city background. Or if you’re feeling adventurous you can grow your own food in pots by the window. This idea is not only beneficial for the environment but is inspiring the UK with programmes such as edible Ebbsfleet encouraging people to create a more sustainable home and there are many flats and properties for sale in Ebbsfleet if you fancy living in garden city with a healthy future in mind. There’s no question, living alone, especially for the first time, can sometimes get lonely. But with a cosy suite to curl up on the only company you’ll be needing is a good film and a hot chocolate. Now you can make any old couch a comfy cradle with just a few fluffy throws and cushions. They’re also a great way of adding accessories to your living space so pick some that really represent you. If you prefer the chic look try simple hues of blue, white and grey or if you want to take a walk on the wild side go for pink tassels with orange detailing and some colourful woven throws. Comfort is key so there’s no cap when it comes to the number of cushions you can have on your couch. 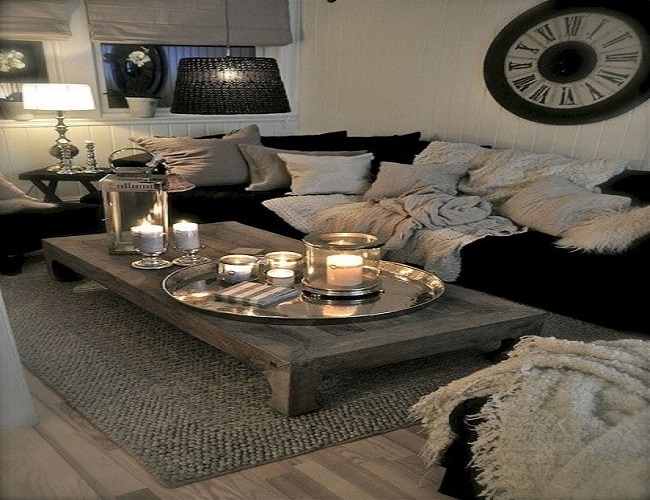 Setting the mood of any room is always down to the kind of lighting you create. While there is a whole variation of lighting to play with you can’t go wrong with a warm golden glow far from the beaming city lights outside. Choose a few lampshades that you feel work well with your design. A bold statement, standing lamp can bring a room from drab to pizzazz and compliment a colourful palette. Candles are always a great way to warm up a room too, with plenty of scents to choose from and a great way to inject a little glamour if you’re having guests. While a studio flat flaunts the ever more popular, airy, open plan look it can sometimes be useful to create a little separation so that your unmade bed can’t be seen from every corner of the room. By tucking your bed away, it will not only help you sleep better, but creates a snug space for you to relax away from the desk or TV. A great way to do this is through a bookcase or stack of shelves. They can act as a wall between two spaces and create a line between what would be the bedroom and living room. A drape or a curtain at the end of the bed can also be the perfect way to give you that little more privacy and separation from the rest of the flat making you more relaxed as you settle down for bed. 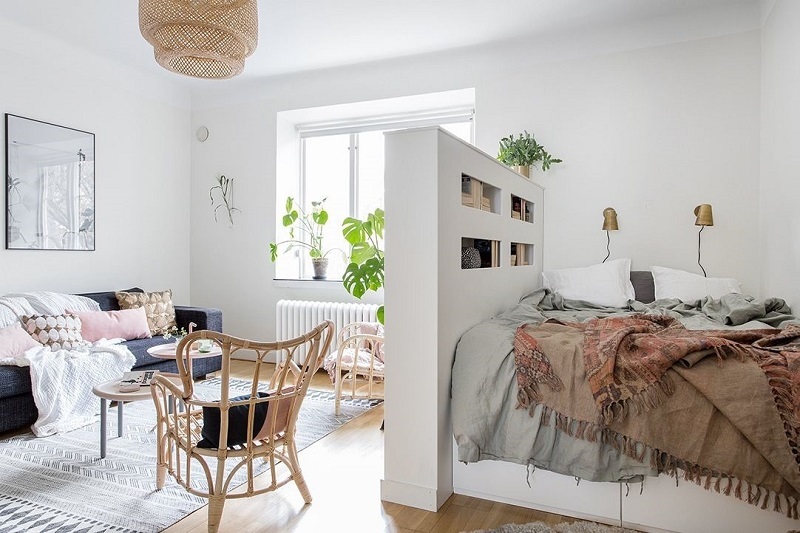 With more and more students and city workers turning to studio apartments as the only option for fuss free commutes and affordable living in places like London popularity has never been so high for these slightly smaller living spaces. So, whether you’re just renting your flat in Bath, have a spacious apartment under shared ownership in London or have bought your first studio somewhere in Edinburgh you can make it your own no matter how much of it belongs to you. 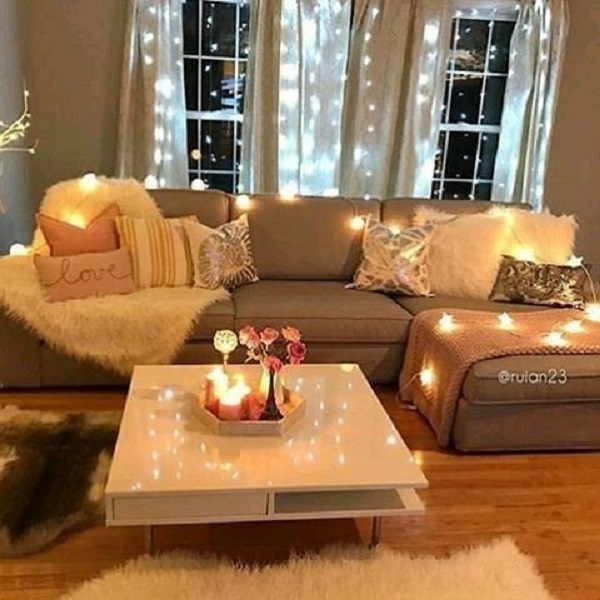 Your space should always be your sanctuary so sprinkle a little love, it can make a big difference.